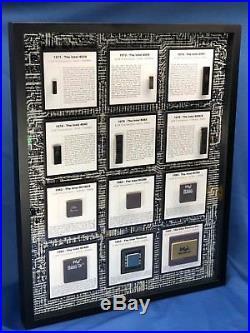 This artwork displays Intel's first twelve chips related to its highly successful x86 microprocessor architecture. Starting with Intel's 4-bit 4004, the world's first microprocessor, this collection maps the evolution to the 8086 and on to the massive Pentium Pro. 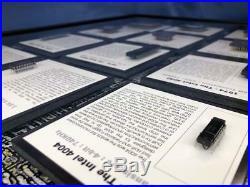 The chips are mounted on placards that provide information about each of the microprocessors. The background is a image of the Intel 4004 computer chip. Each of the chips are Intel and fully functional. Here is a list of the microprocessors used in this piece: Intel 4004, 8008, 4040, 8080, 8085, 8088, 80186, 80286, 80386, 80486, Pentium, and Pentium Pro. The artwork is framed in an 16"x20" black shadow box frame, with glass. All framing materials are acid free. 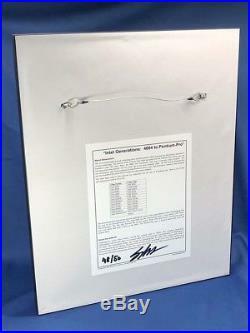 A narrative about the artwork that includes the artists signature is placed on the back of the artwork. Limited to 50, or by availability of chips. Want to see more ChipScapes? Computer chips start out as ordinary sand, which is silicon dioxide. However, the silicon must be made very, very pure. The first step is to melt the sand, in a furnace that reaches about 3200. F, and mix with carbon. This first purification process creates 99% pure Silicon, a common output is Silicon Carbide. The Silicon Carbide is processed in a trichlorosilane distillation method to create 99.9999% pure silicon called polycrystalline silicon. The polysilicon is broken up into chunks. These chunks are melted in a crucible at about 2500. A silicon crystal seed is dipped in molten silicon and slowly drawn out to create a cylinder of silicon. These silicon cylinders are some of the purest crystals on the planet. Once the silicon cylinder is grown to the desired diameter, it is sawed into wafers. These wafers are polished to achieve a very flat mirror surface. Transistors, and other micro-electronic parts, are built on the polished wafer in layers in a process called etching. The wafer is then sawed into its individual chips. Each chip is mounted in an electronic package that serves to protect it and connect it to the outside world. It has been said that computer chips are the greatest value added product in the world. We essentially take a pile of sand and change it into thousands of dollars worth of computer chips. These artworks are the creation of. Are photographs taken of computer chips, boards, and other computer artifacts. They are sort of chip landscapes, or. Most often a macro-lens or microscope is used with special lightning to achieve these unique artworks. Intel, IBM, Fairchild, DEC, Signetics, Intersil, AMD, Zilog, Motorola, MOS, NEC, Texas Instruments, are some of the great chip making companies. Chips like the Intel 4004, MOS 6502, Zilog Z80, AMD 2901, IBM PowerPC and others have changed the way people work and play. Are dedicated to preserving and sharing these computing and communication technologies that changed the world. Artworks are fine collectible artworks. Come is a variety of shapes sizes and colors. Clusters of my artwork make for stunning displays! Would make a great gift for the nerd, geek, engineer, programmer, IT executive, or just that technology savvy person in your life. For more information about ChipScapes. Please check out my ChipScapes. For more information about chip collecting as a hobby. The item "Intel the First Generation 4004 to Pentium Pro 4040, 8008, 286, 386" is in sale since Monday, September 10, 2018.